SHARP BLADES with a straight tip, sharp point offering precision trimming. We all know there is nothing more frustrating than a dull pair of scissors when you want a nice, clean cut. Problem Solved. OPTIMUM CONTROL due to nicely sized finger holes, providing great accuracy. Helpful also for snipping facial hair such as beards,mustache, nose & ear hair. MULTI PURPOSE for grooming, office and travel. Great for your at home Mani Pedi! Ideal for shaping false eyelashes and even decoupage. It is a great feeling to have the right tool handy when you need them! PRECISE & STURDY, with full blade contact, made from surgical grade stainless steel to resist rust and tarnish. 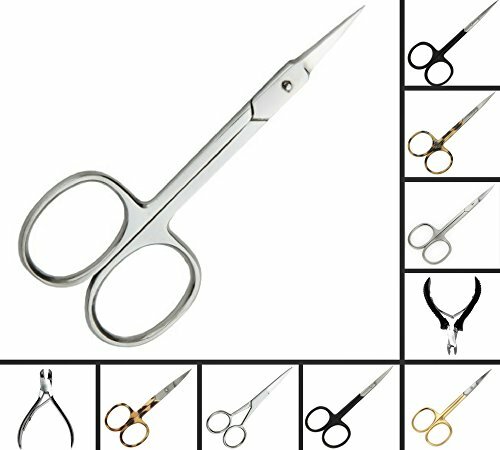 Easily maintain shears by wiping with a soft, dry cloth and storing in closed position when not in use. QUALITY that will last! Manufacturer Lifetime Satisfaction Guarantee; Amazon make shopping easy so order now! View More In Cuticle Tools. If you have any questions about this product by Precision Personal Care, contact us by completing and submitting the form below. If you are looking for a specif part number, please include it with your message.